There's something curious about sailing and being on the water. It's not always that just any music will do. Sometimes you have to hear that soothing rhythm that reflects a soul borne on the water. Here are a few samplings. Please send us your favorite tunes to add to the list. One of the quintessential sailing songs of all time. 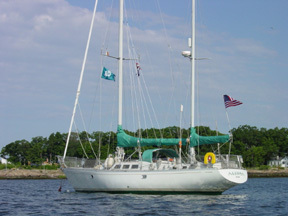 Joel owns a boat called "The Alexa," which he designed and built on Long Island. It is a Shelter Island runabout. It was named after his daughter, Alexa Ray. Boating is one of Joel's favorite hobbies. He often makes nautical references in his songs, and his personal management company is called Maritime Music. He lives in Oyster Bay and has just launched a radical new boat design - see Soundings magazine September 2005 cover story. Editor's note: Isn't it amazing how uncomplicated lyrics were in the '60s? Lyrics and Music by Dennis DeYoung. Copyright 1977. Soon I will be free yeah. Here are some 'original' sailing tunes of ours just waiting for the right preformer!